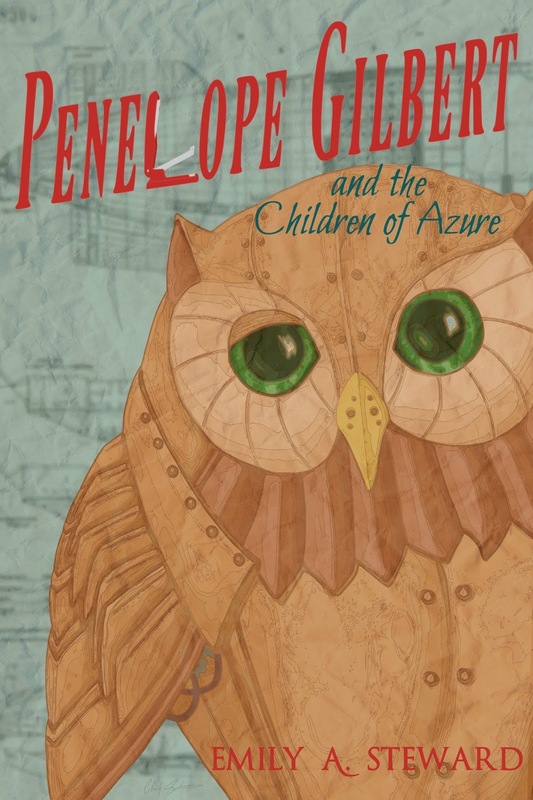 Today I want to Welcome Emily Steward, the author of Penelope Gilbert and the Children of Azure, a middle grade fantasy novel. This book is awesome! A six-foot-tall arachnid hovered over them. One of the creature’s razor-sharp metal legs was raised to attack. The scream seemed to confuse it. It wasn’t much of a window, but it was long enough. She rolled to the side just as the beast’s leg smashed into the ground, leaving a deep hole behind. Crane turned to see what was happening. He let out a cry and fell back into Haldor. “Come on!” she yelled to Haldor who was wriggling out from under the spider corpse. She ran to the spot where she saw the creature enter as Haldor hurried to catch up. She scrambled through the brush until she came to a stream. There she saw the spider. He was across the water under a large tree. Above him were several objects swinging in the breeze. It took her a moment to realize that they were rotting bodies strung up by their necks. Their unseeing eyes stared eerily into the darkness. Upon closer inspection, she saw that there were at least thirty of them. She wretched silently as she tried to think of a way for Crane to not become one of them. The spider was already trying to wrap a strand of webbing around his neck. A thought occurred to her. An outrageous, outlandish thought. I can do this, she assured herself. She tried to picture every last detail of her slain foe—every creepy crawling, hairy, shiny detail. Penny could feel the energy pulsing through her. 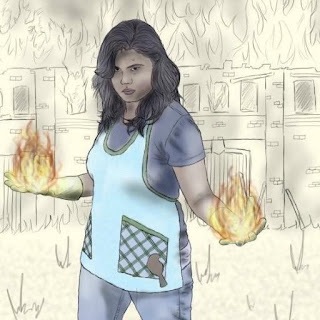 Her hands were no longer her own. Her teeth had become fangs, and her eyes were the eyes of a killer. I love the ability to share the stories and ideas I have running through my head. It’s so cool to see a project come together, and a story form out of nothing. You also can’t beat the flexible hours! The hardest thing is finding the time to sit down and actually write and there are so many distractions when I finally do. I write primarily middle grade books. I’ve written a mystery/horror novel that I hope will be published in the near future and I’m also working on a realistic fiction book along the lines of a more contemporary Harriet the Spy. My latest release is my debut novel and it’s a middle grade fantasy called Penelope Gilbert and the Children of Azure. That persistence does actually pay off! I’ve also learned the value of good writing buddies and critique groups. These have been so helpful. Some critiques may sting, but there is usually something you can learn from them… even if it’s how not to critique others. I would have to say Penny from my new release. She has a great imagination, a feisty spirit, and she has the awesome ability to morph into anything! I’m not too familiar with these hero types. I do like a good antihero though as long as they aren’t too dark. A hero with some flaws is much more interesting and relatable like Captain Jack Sparrow. You never know quite what he’s going to do. Well, I first started writing it about ten years ago. I just decided to quit waiting for inspiration to strike, and start writing. The story looks a lot different now than that early draft, but it was effective because it got me out of my head and actually writing. I took some long breaks and took a few writing courses before I got back to it. 1. Sometimes I wish I had the power to turn back time so that I could do something outrageous and funny and then take it back afterward. 2. When I was 8 or 9 I started a no girls allowed club. I said that I was a tomboy, so I let myself in. 3. When eating M&M's I have to eat an even amount at a time. Preferably the same color. I almost always have to leave the house and go to the library or a coffee shop. I just can’t concentrate when I can see things around me that need done. I actually love to eat sunflower seeds while writing, but sunflower seeds are not exactly an easy thing to eat in public without looking like a cow chewing my cud. Since I prefer to write in public, my methods kind of clash. My books are a little eclectic. I feel like each one could have many sub genres. This is partially due to the fact that I don’t work well with an outline. So I may veer off a bit, but it all seems to work together in the end. I plan on diving into book two in my Penelope Gilbert series very soon. I already have a few chapters and a (very) loose outline. Thank you for a fascinating interview. I love your "no girls" club idea! So funny! Nice to 'meet' you here, Emily and congratulations on your new release! The excerpt had me spellbound as if I was watching a movie. I wish you all the best.